I am always glad to note some positive comments about FEMA, when they happen. See A Season of Wild Wind and Water, in Homeland Security Today, Aug. 15. Amid an unprecedented onslaught of storms and tornadoes, FEMA just may be achieving mission success. 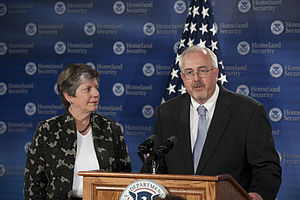 In this season of extensive and devastating disasters, Director Craig Fugate, head of the Federal Emergency Management Agency (FEMA), just may have led his agency to again find its “groove”—effectively aiding disaster response and recovery. Federal, state and local officials from at least a dozen states across the central and southern parts of the country, mostly along the Mississippi River and its tributaries, have worked at full capacity through the spring and early summer to respond to what seems like endless disaster: billions of dollars worth of homes, businesses and public buildings lost, not to mention the deaths of some 527 people as of June 8. It wasn’t that long ago—five years in fact—that FEMA was the much-maligned actor in the Katrina aftermath, blamed for everything from the personal incompetence of top officials to decisionmaking slowness and logistical disorganization. Knowledgeable observers say that an infusion of confidence and resources from the Obama administration, combined with Fugate’s sage guidance, prepared the agency for an impressive response to the outbreak of devastating storms and flooding this spring. FEMA gets high marks from disaster experts for inserting field staff into the disaster zones quickly and opening up communication with local and state officials. So many of these tornadoes hit in succession and in multiple states within hours—creating millions, if not billions, of dollars in property destruction upon impact—that FEMA was uniquely challenged with getting resources and people on the ground fast and dealing with different governors and county officials, all with different needs. At the same time, it prepared for and reacted to ongoing flood conditions across at least nine states. This is not to say that FEMA is “there yet,” said experts. It still lacks the resources and focus to prepare for a more catastrophic event. With ongoing economic fragility and more attention paid to the national debt and fiscal restraint on Capitol Hill, however, it is not clear that the agency will necessarily get its wishlist in terms of additional funding. It may just have to make do with what it has. But Fugate’s leadership has improved morale and encouraged a proactive culture, so maybe getting its “groove back” is good enough for FEMA right now. And how do you think think FEMA is doing in its primary assignment of reducing disaster outlays through various means including MITIGATION? Does FEMA as currently operated promote “RESILIENCE” or au contraire?